Quality assurance is of ever increasing importance to health care delivery. One important component in implementing a quality system is the establishment of standard treatment policies and procedures, known in the cyberREN system as Care Maps. Health care organizations may use the term “critical pathway” or “treatment protocol” to describe the same concept. The objective of a system of Care Maps is to achieve consistency in analysis and treatment and to reduce errors / omissions in treating common problems. cyberREN’s Care Map facility enables the physician together with nurse managers to (a) define a set of standards, (b) recommend a series of steps to be performed and (c) measure observable outcomes. Care Maps may also be used to schedule regular maintenance activities for ESRD patients. A Care Map is comprised of a series of sequenced and phased orders, which are intended to achieve a certain health care goal. 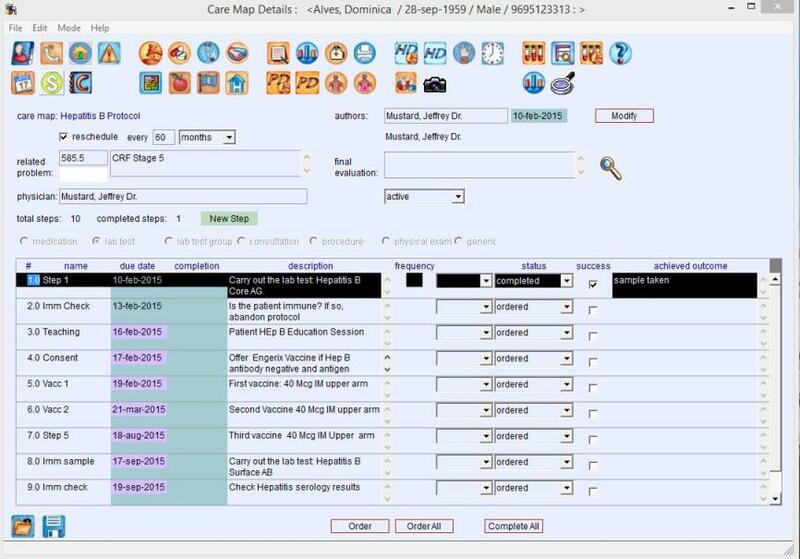 Each Care Map is applied to a single condition or serves a single requirement, for example a new patient entry, an Anemia Protocol or a Hepatitis Vaccine. Any number of Care Maps may be defined in the cyberREN system, and each may be triggered for an individual patient at the appropriate time, as determined by a physician. cyberREN allows for the successful tracking of each Care Map step as well as of the overall success of the Care Map. In this way the Care Map can be improved and refined over time.